Do more in less time with IronCAD’s prebuilt CAD parts catalogs, native FEA tool, translators, and rendering integration. Multiphysics for IronCAD is a seamlessly integrated multiphysics FEA simulation tool that works directly in the IRONCAD interface. Simply add material, forces, and constraints to an IRONCAD model and hit the “Auto Solve” button to generate analysis results. If subsequent modifications are made to the model, built-in associativity will simply update and re-solve. 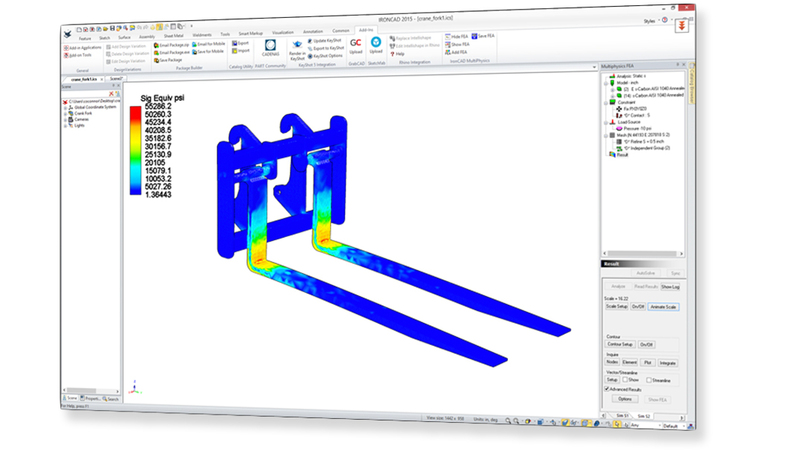 Engineered for everyone from beginners to advanced users, Multiphysics for IronCAD provides fully coupled multiphysics for stress, thermal, and electrostatic analysis. 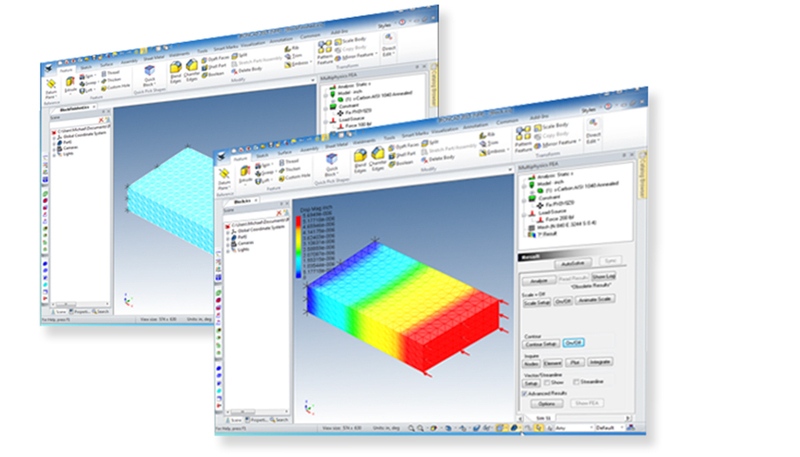 Included in the integrated multiphysics simulation software are the following analysis types: static/steady state; dynamic/transient response; modal/vibration modes; instability buckling; and frequency domain. For specialized users, Multiphysics for IronCAD can be augmented with add-on functionality. The Advance package includes large deformation and large rotation features and can be used to model nonlinear elastic, plastic, and foam materials. 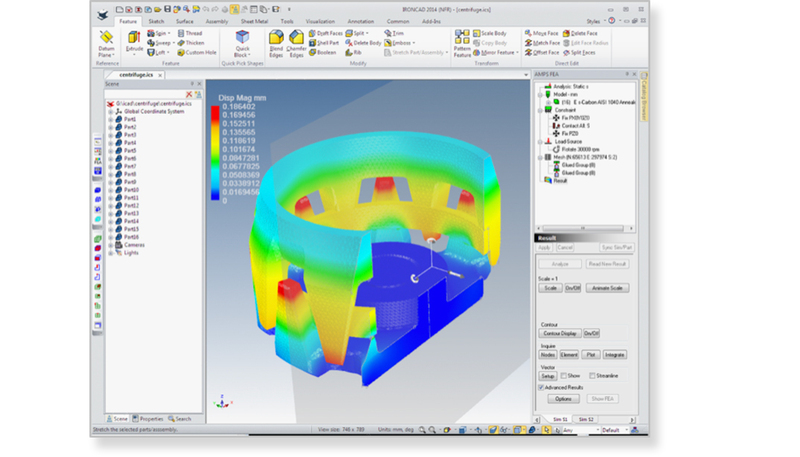 The Advanced Dynamic add-on includes stress stiffened modal and arc-length nonlinear buckling analysis, and the Fluid package covers flow physics impact. Register to access your FREE 30-day trial of Multiphysics for IronCAD with full functionality that will install onto your local IronCAD Installation. At the end of the trial, Multiphysics for IronCAD will continue to run in a limited version unless purchased. We detected that you are not on a Windows device, trying IronCAD or Design Extension will require installing on a Windows environment. Once you access a Windows Environment, return to this page to access the download. Your local reseller will be in contact to help. We’re sorry, we can’t find your email address in our system.